I’ve been in the mood for stripes lately – swingy stripes. For my big project this month, I wanted to find the perfect pattern to pair with a lovely striped wool jersey from Mood (sadly, out of stock, but here’s a similar, albeit narrower, stripe in the fetching combination of navy and pea green) that I bought with my Mood Sewing Network allowance. I was imagining a full, gathered skirt to take advantage of the beautiful drape in the fabric. When I was contacted by BurdaStyle about doing another guest post, I jumped at the chance to make their Swing Dress 08/2012 #133 pattern. It not only had a full skirt but also had a bodice that I thought would play well with stripes. When everything came together, I was thrilled with the contrasting stripe directions in the bodice; the pairing of the horizontal main bodice piece and the vertical side pieces add dimension as well as fit and flatter. Unfortunately, my inexperience with sewing shows through a bit here. I originally chose this wool jersey because I’d heard such good things about the this type of fabric but had yet to sew with it. When picking the pattern, it hadn’t occurred to me that this wool jersey was a knit, not a woven. Silly, I know. I realized pretty quickly that the bodice was going to stretch out like crazy if I attached the weight of the skirt. So, I kept the bodice and skirt as separate pieces. To finish the bodice I added a band along the bottom, two stripes wide. And, since the invisible side zip I had planned for this dress was no longer going to work without the skirt attached, I added a button placket and four buttons along the side to close it up instead. So that the black buttons would be a little more discreet, I spaced them so that they fell in line with the black stripes along the back. I hadn’t realized until it was too late that this placement meant the top would end up buttoning with the edge of the button placket towards the front. Even so, I’m quite pleased with this top. I finished up the skirt by adding a band of thick black elastic to the top. As a separate piece, it’s extremely versatile. I can wear (and have already worn!) it with quite a few things in my closet, dressed up for work or down for a weekend adventure. What I’m most proud of though is my efforts to match stripes. 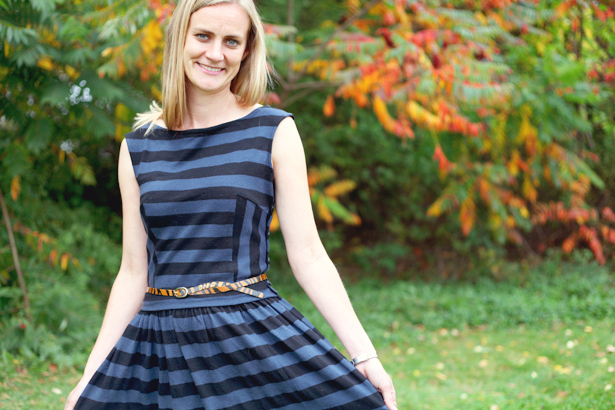 The print-at-home-with-no-seam-allowances BurdaStyle pattern was key to my stripe matching efforts. To start, I actually printed the pattern out twice and taped it together so I had each pattern piece in full. I then drew lines perpendicular to the grain line to help me align the stripes along all of the edges. Because there were no seam allowances, I knew everything covered up by each pattern piece was going to be a part of the completed garment, which further helped me place the stripes. I then traced around each piece with chalk and loosely cut around it. When I was sewing each piece together, I made sure to pin along the chalk line but then sew just inside the line since that’s actually where the edge of the pattern piece actually was. For the side bodice pieces I actually drew each of the stripes on the pattern pieces and labeled which ones were going to be the black stripes. This extra step ensured both pieces were mirror images of each other. 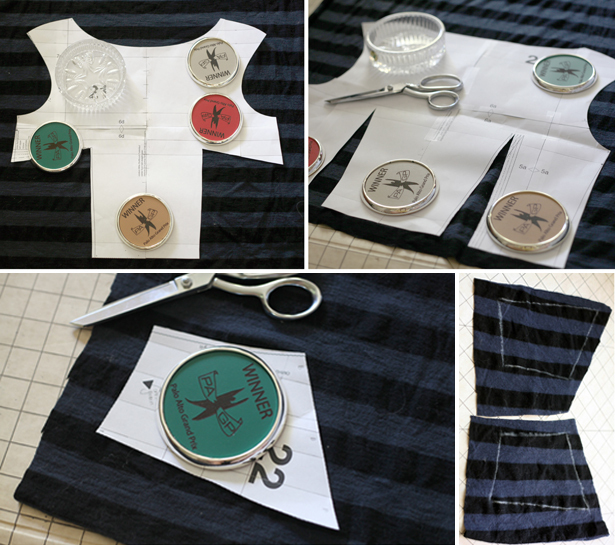 The extra effort to perfectly match the stripes meant that even the darts on the back bodice are nearly invisible. The above photo is proof of just how swingy these stripes are. The collage below is further proof. I had so much fun twirling in the leaves for these shots. These photos were actually taken this past weekend when my husband and I were on a whirlwind trip to New Hampshire for a wedding. 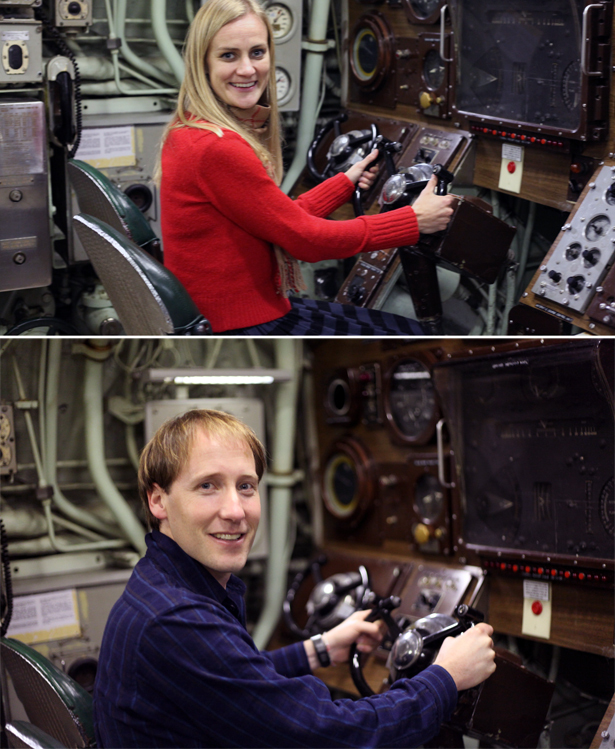 We had an extra hour on our way back to the airport on Sunday, so we took a tour through the USS Albacore, a research submarine now docked on dry land, after taking photos in a pretty patch of fall colors. You can see how I was actually wearing this dress during the day: all bundled up with a bright cardigan and a plaid scarf. It was chilly! But, I think the gray and black stripes actually work well paired with bright colors and mixed patterns. Thanks Mood for another great project! Watch out for this dress on the BurdaStyle blog as well!